If you are considering making your own invitations for your next celebration then let us help you. There are a number of reasons why you might consider making your own invitations. Cut down the costs - especially with a wedding it is ofter cheaper to make your invitations than to purchase them. Create a unique design - By taking the time to design and personalize your invitations you get the chance to inject a piece of you into them. Necessity - Often we cannot find an invitation with the right colors to match our celebration theme. Or perhaps the invitation designer is unable to accomodate your invitation needs. This is the time when being able to make your own invites would an ideal option. 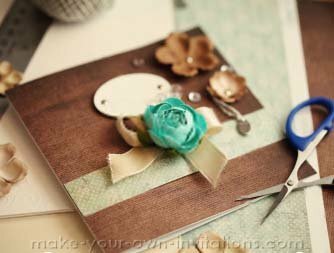 tutorials to show you how to make numerous invitations step by step. Invitation wording ideas for baby showers, weddings and birthday invites. Clip art that you can print and utilize. Free Printable fillout invitations . Exampes of themed invitations to inspire your own design. What Invitations are you planning on making? Create elegant wedding invites. We have options to suit your wedding budget with tutorials to make pocket folds, layered invites and more. Make fun and creative birthday party invitations for kids and adults alike. Get the family involved too with craft paper scissors and glue! Cute handmade baby invitations for the mom-to-be. With themes like monkeys, jungle, blue boy and pink girl, there are some unique invitations too. You are sure to find inspiration in our growing galleries of hand made invitations and cards.We have a growing photo gallery full of wedding invitations for the DIY bride, Baby Shower Invitations to host a party for the mom to be, birthday party invitations for young and old plus a whole heap more! They are all submitted by creative types just like you who either wanted to add their own special touch to create a unique, one of a kind piece or who might simply want to save a few dollars by making their invites themselves. Whatever your occasion we have something for everyone. Each invitation photo submitted to the gallery is accompanied by how-to tips and pointers, there are even a few tutorials complete with directions to show you how each invitation was made. Take a tour of this site and check out some of the invitations we are featuring. This should get your creative juices flowing to see you on your way to creating your own original masterpieces. If creativity is not your strong suit then have no fear. We will show you how you can make your invites using your computer with our free invitation clipart and your word processing software. You will also find right here on this site a fantastic selection of free to use printable invitations for most occasions that you can print straight to your desktop printer. So whether you are looking for invitation ideas for a wedding, a graduation celebration or a simple 'let's have coffee' card for your girlfriends you are sure to be inspired by all the wonderful talent that others want share with you. we know you will enjoy your visit and will find the inspiration to create the perfect invitation cards for your special occasion. We hope you will share with us your own creations and help us to make this completely free resource even better.